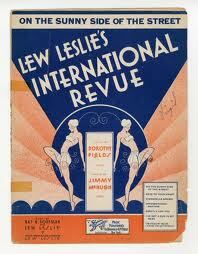 “On The Sunny Side of the Street” was introduced in Lew Leslie’s International Revue. The song was one of the first in a series of cheerful songs to try to cheer people up over the Great Depression. It has proven popular with singers, who love the wonderful Fields lyrics, and jazz players, who love McHugh’s swingy tune. Can’t you hear the pit-a-pat? “On the Sunny Side of the Street” was recorded on January 27, 1967 and released that year on the album Tony Makes It Happen! It was arranged by Marion Evans. “On The Sunny Side of the Street” was recorded on January 31, 1971 and released that year on the album Get Happy with The London Philharmonic Orchestra. It was arranged by Marion Evans. “On The Sunny Side of the Street” was recorded on December 13, 1972 and released in 1973 on the album “Listen Easy.” It was arranged by Don Costa. “On the Sunny Side Of The Street” with Willie Nelson was recorded in 2011 and was released that year on Duets II. It was arranged by Marion Evans.